The Milwaukee Brewers announced their minor league coaching staffs on Thursday and Appleton native Matt Erickson will return to manage the Class A Wisconsin Timber Rattlers for a ninth straight season. 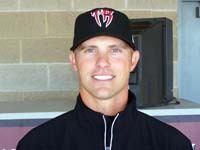 Erickson, who was the Timber Rattlers hitting coach in 2009 and 2010, has been with the Rattlers since the team’s affiliation with the Brewers began. The Timber Rattlers have been to the Midwest League playoffs three times under Erickson’s direction. Wisconsin won the 2012 Midwest League Championship with Erickson at the helm. He is the longest-serving manager in the history of Appleton Professional Baseball. His regular season record with the Rattlers is 536-574 (.483). Erickson will be joined by former Brewers relief pitcher Jim Henderson, who pitched for the Timber Rattlers in 2009. He was named the Timber Rattlers pitching coach for the 2019 season. Dave Joppie, who managed the Kane County Cougars in 2004 and 2005, enters his third season in the Brewers organization as the hitting coach of the Rattlers. Henderson made his MLB debut on July 26, 2012 against the Washington Nationals, the organization with which he started his pro career. 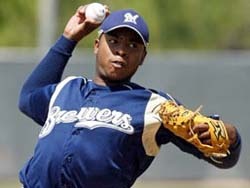 Henderson appeared in 111 games over three seasons with the Brewers and collected 31 saves. He pitched in 44 games for the New York Mets in 2016, his final season in the majors. This will be his first full-season as a coach in the Brewers minor league system. With opening day in sight, the Milwaukee Brewers trimmed their roster to 27 players, with two more moves necessary to get to the opening day 25-man squad. Headlining the moves yesterday were infielders Matt Clark and Jason Rodgers being sent to Class AAA Colorado Springs. Both had good springs and were being considered for the opening day roster. 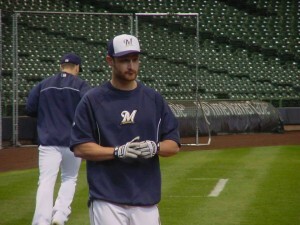 The Milwaukee Brewers blanked the UW-Milwaukee Panthers 8-0 in their exhibition opener yesterday in Phoenix. The Brewers blanked the Panthers as eight pitchers combined on a 1-hitter. Reliever Jim Henderson pitched in a game for the first time since May 2 of last season, working a hitless inning. The Brewers play their Cactus League opener in Tempe, Arizona this afternoon. Kyle Lohse will get the start for the Brewers. Barring an upset, Lohse is expected to be the Brewers starting pitcher on opening day. closer Francisco Rodriguez has been rock solid, but injuries to Jim Henderson and Tyler Thornburg and inconsistency from Brandon Kintzler and Rob Wooten has left a once rock solid bullpen a bit short. 5-1 at Miller Park. Jeffress opened some eyes with fast balls clocked at 97, 98, 99 and eventually 100 miles per hour. After allowing five runs, four hits and a walk in last night’s 8-3 loss to the Cincinnati Reds, the Milwaukee Brewers have placed relief pitcher Jim Henderson on the 15-day disabled list because of right shoulder inflammation. Outfielder Caleb Gindl has been recalled from Triple A Nashville to take his place on the roster. Henderson struggled with his velocity during spring training and lost his closer’s job to Francisco Rodriguez right out of the gate this season. Henderson (2-1) has pitched 11 1/3 innings, allowing 10 runs (9 earned) and 14 hits, including three home runs. His ERA stands at 7.15. Gindl was hitting .284 with two home runs and six RBI’s over 25 games at Nashville. Jim Henderson struck out Matt Adams with two runners on and two out in the 9th inning last night to pitch the Milwaukee Brewers to a 6-4 win over the St. Louis Cardinals in the home finale at Miller Park last night. It was Adams who clubbed a 2-run homer off of Henderson in the ninth inning on Friday to snap a 4-4 tie and give the Cardinals a win in 10-innings. The Brewers finished 37-44 at home this season. The Cardinals finished 14-5 against the Brewers this season. Norihika Aoki doubled home a run and scored three times for the Brewers. Wily Peralta gave up five hits and walked five in five-plus innings for the Brewers. The Cardinals had learned earlier in the day that they clinched at least a spot in the post-season playoffs. They hold a 2-game lead on both Cincinnati and Pittsburgh atop the NL Central with a week left in the regular season. Logan Schafer said he wasn’t surprised when he got the squeeze sign with the bases loaded in a tie game in the 9th inning. Schafer dropped a pinch-hit squeeze bunt with the bases loaded to give the Milwaukee Brewers a 4-3 walkoff victory over the Chicago Cubs on Tuesday night. Aramis Ramirez walked to open the inning off Justin Grimm (0-2), who came out to start the 9th. Jeff Bianchi pinch ran for Ramirez and advanced two second on a single to center by Carlos Gomez. Grimm then mishandled Scooter Gennett’s sacrifice bunt for an error to load the bases. After Caleb Gindl popped up, Schafer came on to lay down the game winning bunt. Both teams starters, Jeff Samardzija for the Cubs and Marco Estrada for the Brewers, pitched well but were not involved in the decision. Game 3 of the 4 game series is tonight at Miller Park. Tyler Thornburg (2-1, 2.18) goes for the Brewers. Lefty Chris Rusin (2-4, 2.85) pitches for the Cubs. Pinch-hitter Travis Snider homered in the 9th inning to lift Pittsburgh to a 4-3 win over the Milwaukee Brewers on Tuesday night, clinching the Pirates’ first non-losing record in 21 seasons. Snider drove a 2-2 pitch from Jim Henderson over the wall in center for his second pinch hit homer of the season. It was victory number 81 for Pittsburgh, insuring the Pirates will not finish with a losing record for the first time since 1992 when they finished 96-66. The Pirates’ led in the NL Central is now 2-games over the St. Louis Cardinals, who fell to the Cincinnati Reds 1-0. Yovani Gallardo didn’t have his good stuff but did make it through 7-innings, allowing 2 earned runs on 5 hits. He was not involved in the decision. The Brewers fell to 0-5 on the home stand. They’ll wrap up their series with the Pirates tonight. Wily Peralta (8-14, 4.51) pitches for the Brewers. The Pirates counter with Francisco Liriano (15-6, 2.57). Khris Davis clubbed a pair of two-run homers in consecutive at-bats for the first multi-homer game of his career, leading the Milwaukee Brewers to a 6-4 win over the Cincinnati Reds in the series opener on Friday night. Davis has 8 home runs this season with all 8 coming in the 23 games since he returned to Milwaukee from the minors, his third stint with the team. Scooter Gennett also homered for the Brewers, who won at Great American Ballpark for just the second time in seven games this season. Rob Wooten earned the win in relief and Jim Henderson notched his 23rd save. Wily Peralta pitches game 2 of the series for the Brewers tonight.